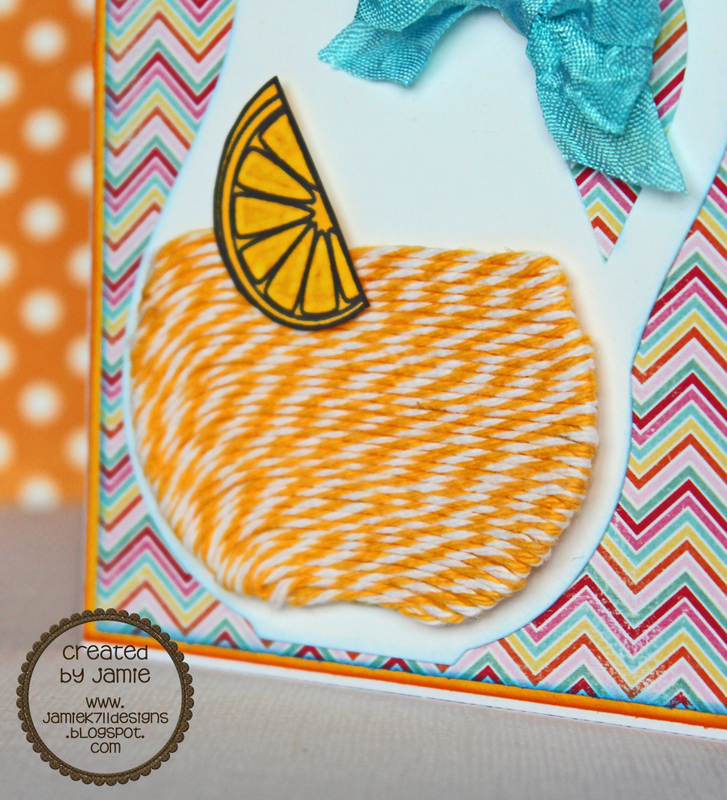 This month we're featuring Lemon Tart and it's the perfect color for Lemonade! I glued down the Lemon Tart and added a stamped image of a lemon on top. 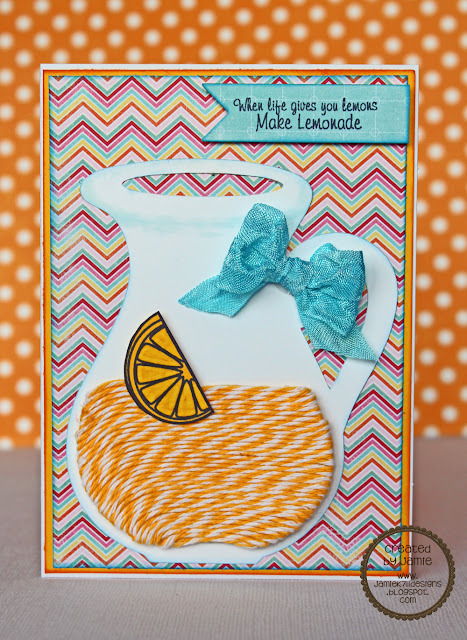 Here's a closeup of the "twine" lemonade. 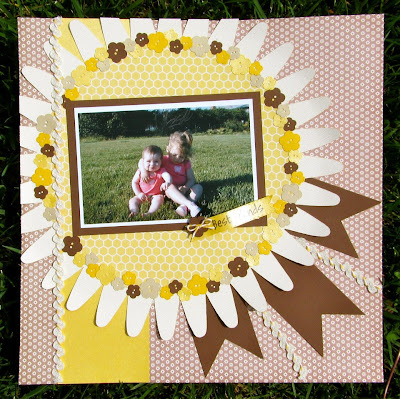 For Details on my project please visit my blog HERE. 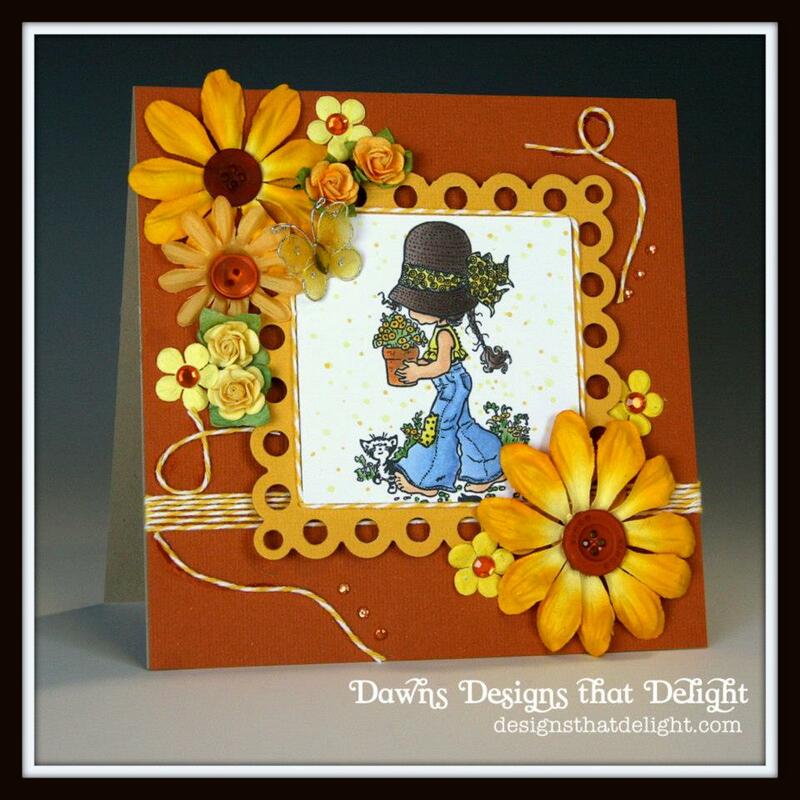 It's Dawn here from Dawns Designs that Delight. For one of our gifts I decided on updating a notepad and pen for our special teacher. After hours on pinterest, and some time sitting and just thinking in my craft room .. I decided that a notepad would be a perfect gift. It's small enough to fit in a purse .. or even something that can sit on a desk to jot down little daily reminders. I sure do hope she will like it! You may find all the details on the products that I've used over on my blog HERE. I think our color of the month really works with this ... LEMON TART ... Besides it IS my all time favorite twine color! Chick HERE to shop at the AWESOME Trendy Twine Store! Have a fantastic week Twiners!! It's Kendra from Luv 2 Scrap N' Make Cards for one final post as a Guest Designer!! I've really enjoyed Guest Designing this month and hope you've been inspired by my work! 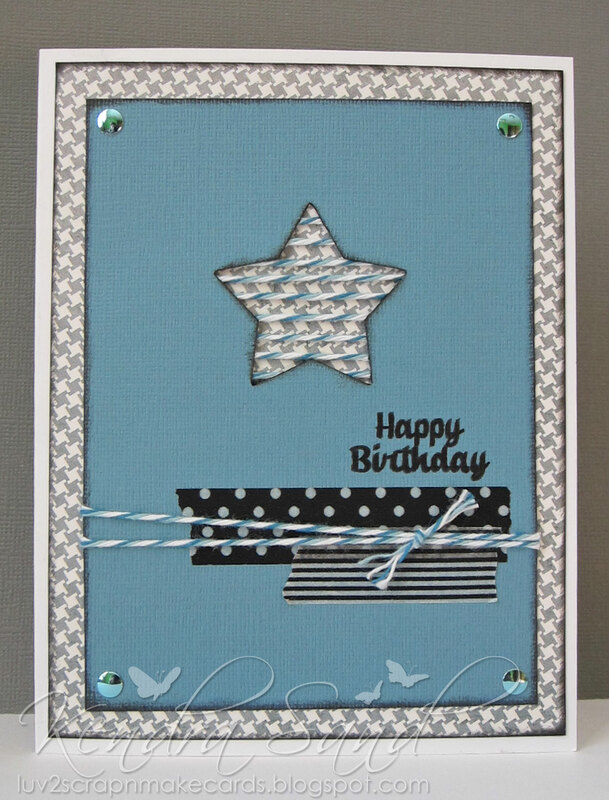 I used my die cutting machine to cut the star out of my cardstock and then added the Blue Berry Trendy Twine behind! 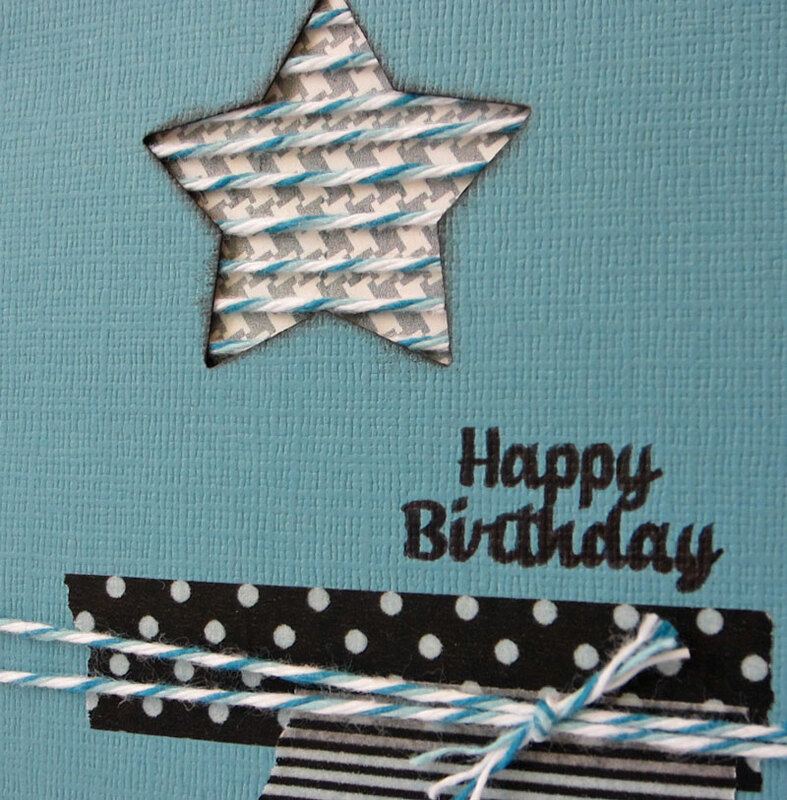 Along with a little wrapped around the card over the washi tape. I thought it was a fun look!! Thanks for having me Guest Design!! 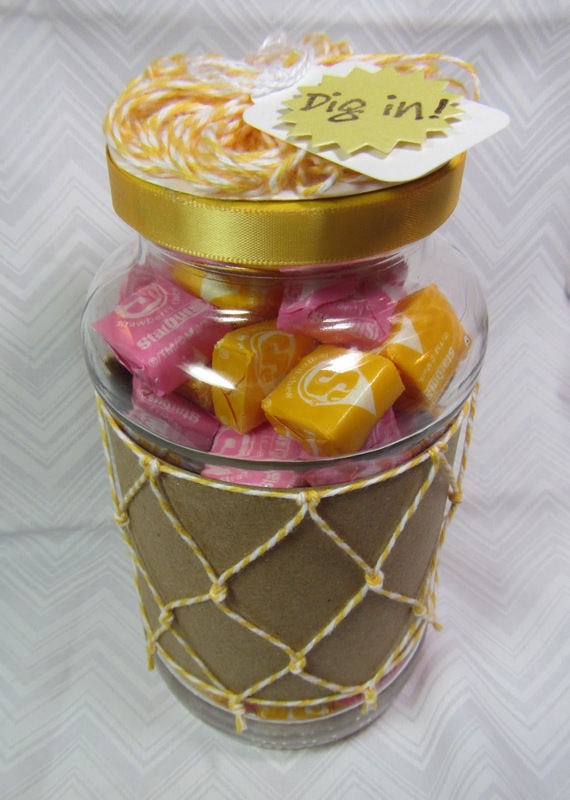 Hello, hello, it's Becki from The Happy Card Encouragement Factory back again with (well, what I think anyway) a super cool way to use my favorite twine in the world. Lesley challenged us to make flowers with her lovely twine and that's exactly what I did. If you would like to see the cutie-patootie that was my unconventional model and how I made these adorable flowers, head over to my blog and check it out. I won't have a full blown tutorial right now, but I will give the supplies and a few links. Before you head over there, pick up the four colors I used here so you can be all set to make your own - Lemon Tart, Grape Fizz, Orangesicle, and Twisted Lime. 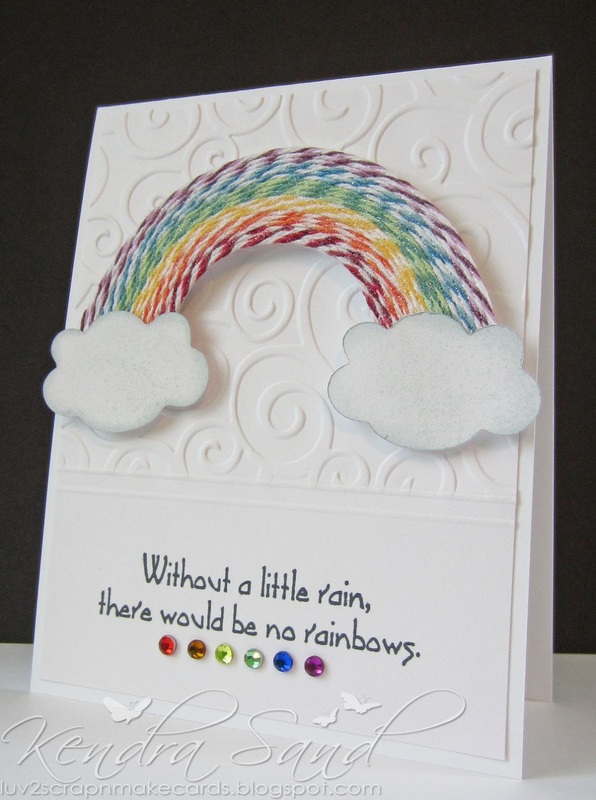 Hi Everyone, it's Kate here of Kate's Creative Corner. I made a Spring or Summer LO for today. You still have to link up on our Challenge, Check it out HERE! You have until this Friday. Everything is coming up Magnolias! It's Karen from SCRaPPYCaNuCK STuDioS. 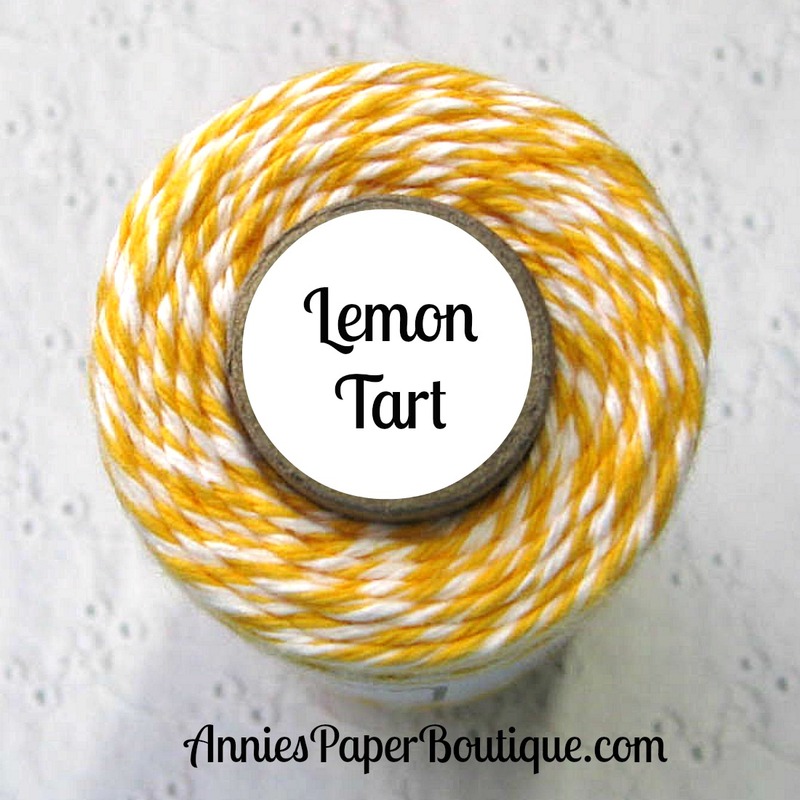 This month, we are getting crafty with Lemon Tart twine - a great yellow and white combination that can be used for so many things! 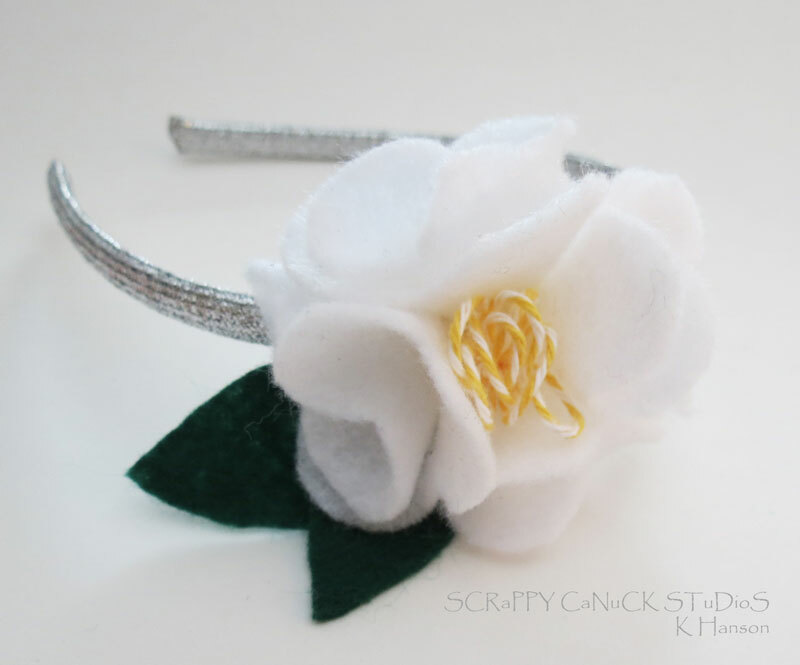 I decided to try my hand at a cute felt flower for headband, complete with a Trendy Twine centre. 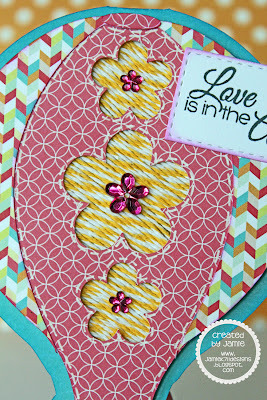 I love the soft look of the looped twine in the middle of the flower - I think it adds a fun pop and focal point! If you would like details on how to make this flower, pop on over to my blog! I'll have all the details there for you. And don't forget about this month's challenge - Twine, flowers and sentiment! We want to see your projects! It's Yvonne from the DT and today I have a fun Treat jar project for you. 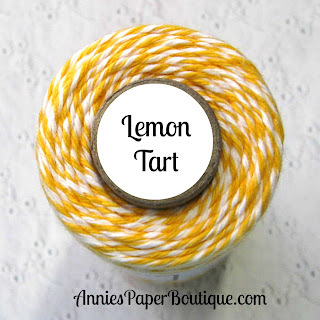 We are working with Lemon Tart twine this month and I Just love the bright yellow color. 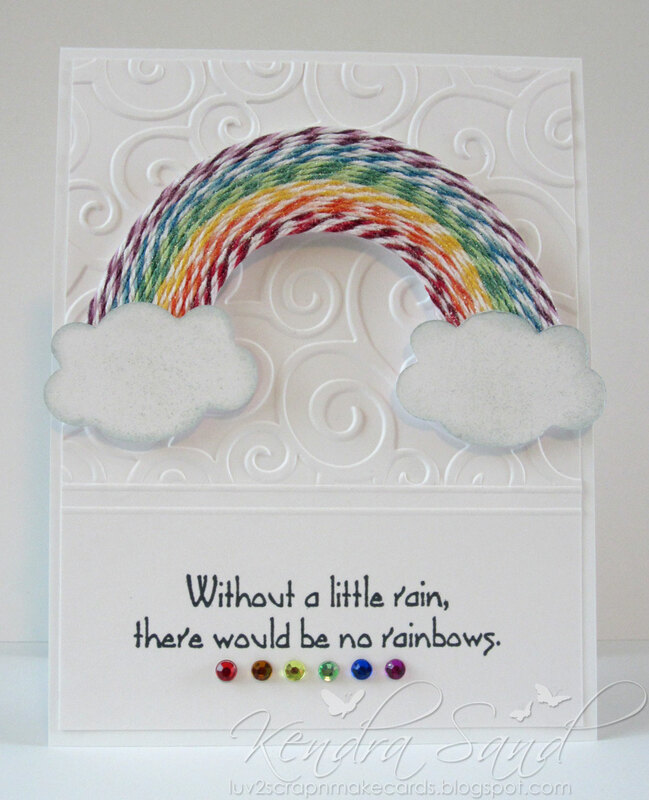 For more information about this project visit my blog here. Hope to see your Talents shared with us at our next Challenge and join us here and at our Facebook page for even more inspiration. 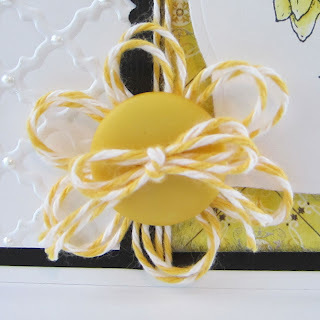 I'm Helen from HTB Creations here to show you some treats today featuring the fabulous Lemon Tart Trendy Twine which is on sale this month! Happy Wednesday :D It's Alyssa here from My Thoughts Exactly. Today I have a cute and simple treat bag topper to share with you featuring Lemon Tart Trendy Twine! For the bag topper I just used the Spellbinder's Labels 1 and folded it in half. Then stamp and decorate with some beautiful vibrant Lemon Tart Trendy Twine, viola! Don't forget to grab Lemon Tart on SALE this month only!! And be sure to join in this month's challenge! 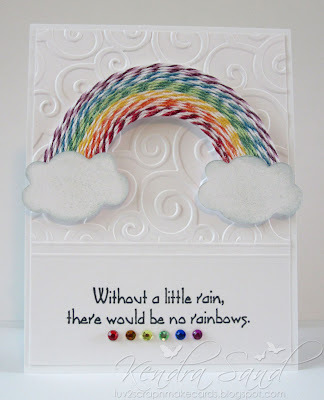 Jamie here to share my take on the Challenge for this month. This month we are featuring Lemon Tart. I made this cute Hot Air Balloon shape card. I took Lemon Tart and glued it to the base of the balloon and then used some Black Licorice for the strings. 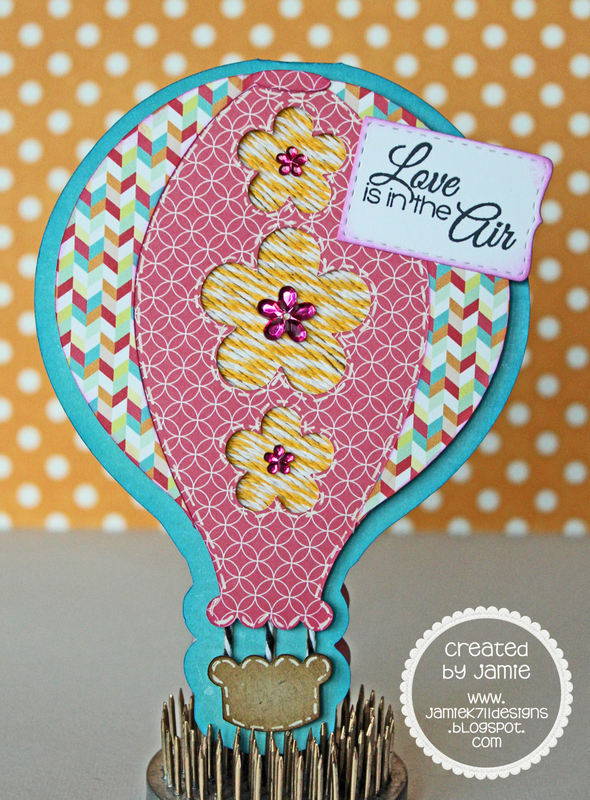 Then I pop dotted the balloon and basket on top of the base. Close up of the twine. 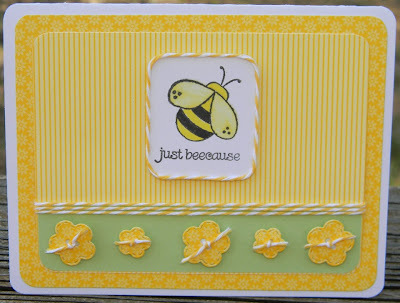 For complete details on my card please visit my blog HERE. You can get Lemon Tart on sale HERE! We'd love for you to play along in our challenge with us HERE! 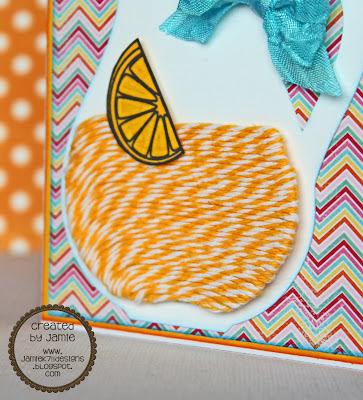 Today I have a layout featuring Lemon Tart Trendy Twine which is on sale this month. 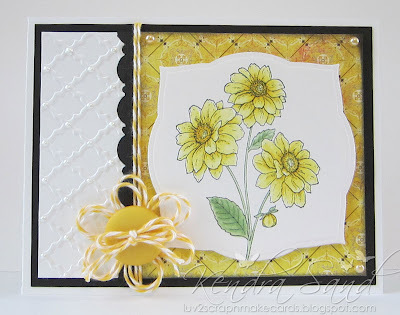 My layout follows the fun monthly challenge we have going on and there is still plenty of time to join in. I like to embellish my photo mats with twine so I wrapped the bottoms and accented them with a bow. 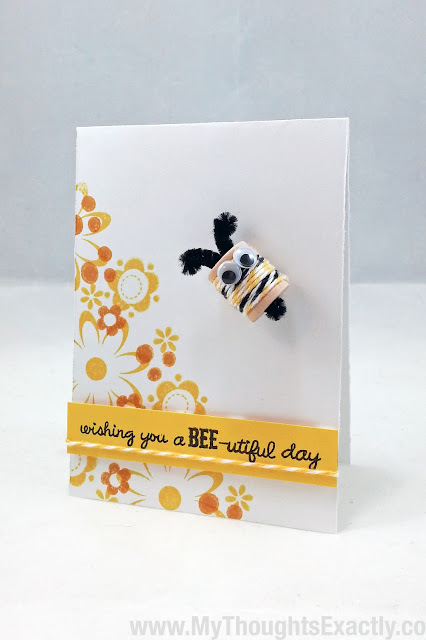 To create the twine path for the bee, I just added some glue to the twine and looped it around. If you would like more details on my project, please stop by my blog. 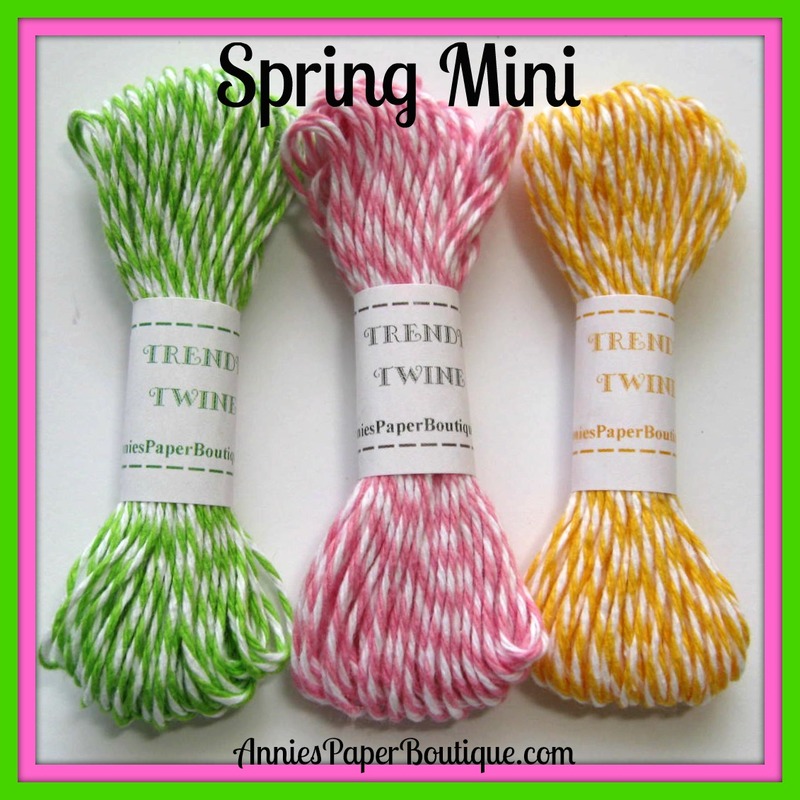 We have a couple of specials on twine this month, a Spring Bundle and Spring Mini. Aren't these colors gorgeous? Remember to stop by the store to see all of the specials going on. Have a great day, Sukie! 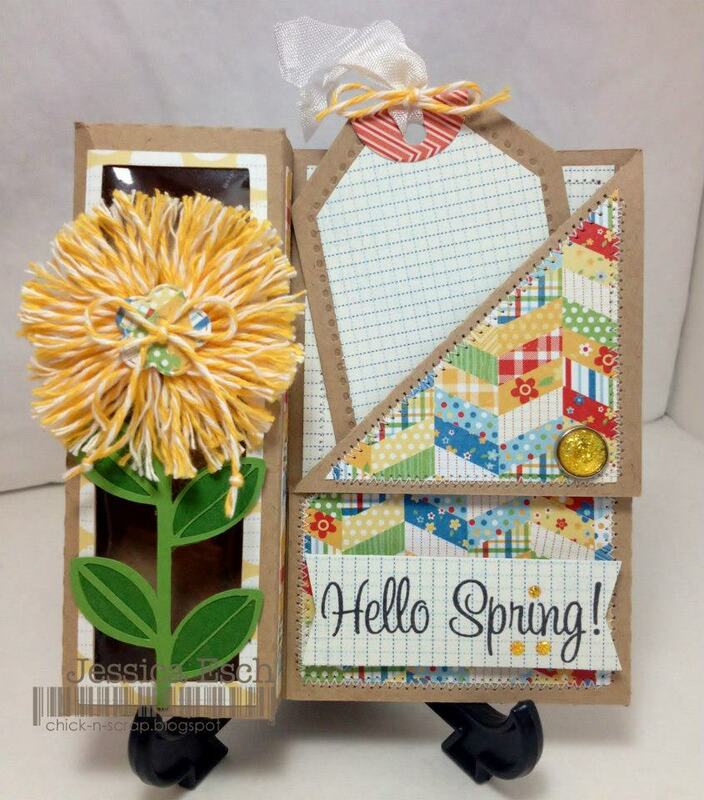 It's Kendra from Luv 2 Scrap N' Make Cards again, with another fun card to share with you!! When I was asked to Guest Design I knew exactly what I wanted to do for one of my posts, as it's been on my mind for awhile now, but haven't gotten to it. 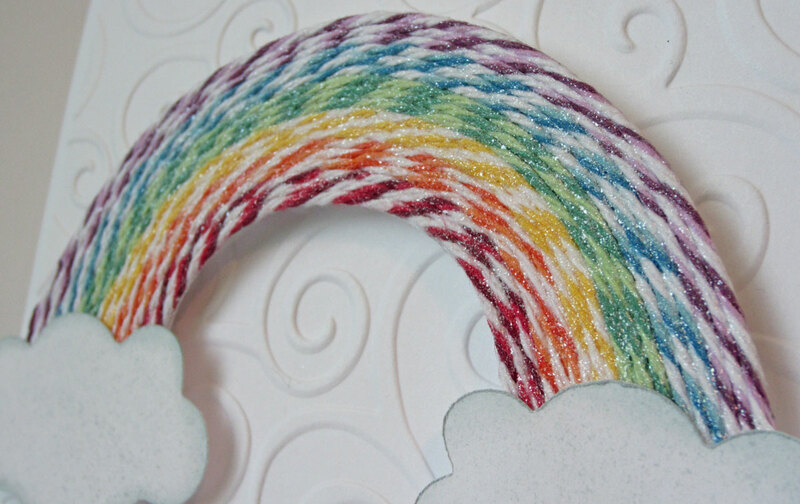 I wanted to use my Trendy Twine to create a rainbow! I really like how it turned out!! I used Peppermint Stick, Orangesicle, Lemon Tart, Twisted Lime, Blue Berry and Grape Fizz! I used the twine to create the rainbow and then finished it off my adding some shimmery paint to give the finished rainbow some shimmer!! 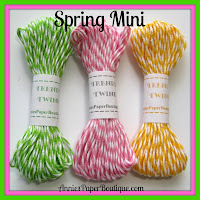 I really like all the different colors of Trendy Twine!! Hey, Trendy Twiners! 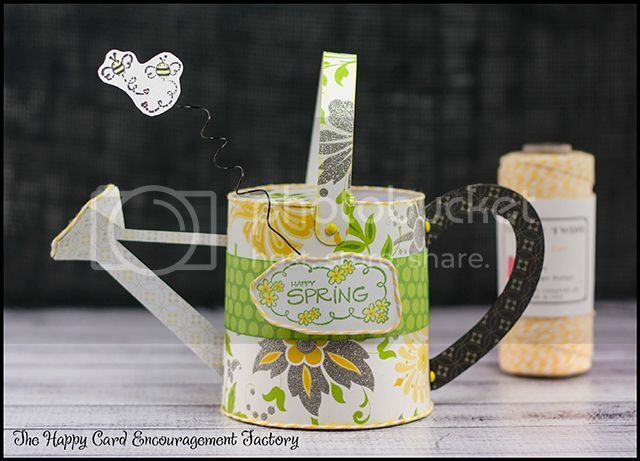 Are you in the Spring mood, yet? It's Jessi from Kissin' Krafts here to brighten your day! 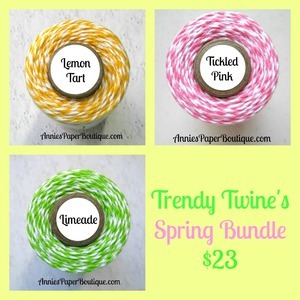 This month's Trendy Twine spotlight twine, Lemon Tart (currently on sale for $7.95), is sure to do the trick! I love the brightness. 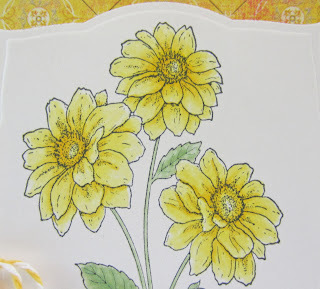 It just screams SUNSHINE to me! Who doesn't love to curl up to a book while soakin' up some rays? 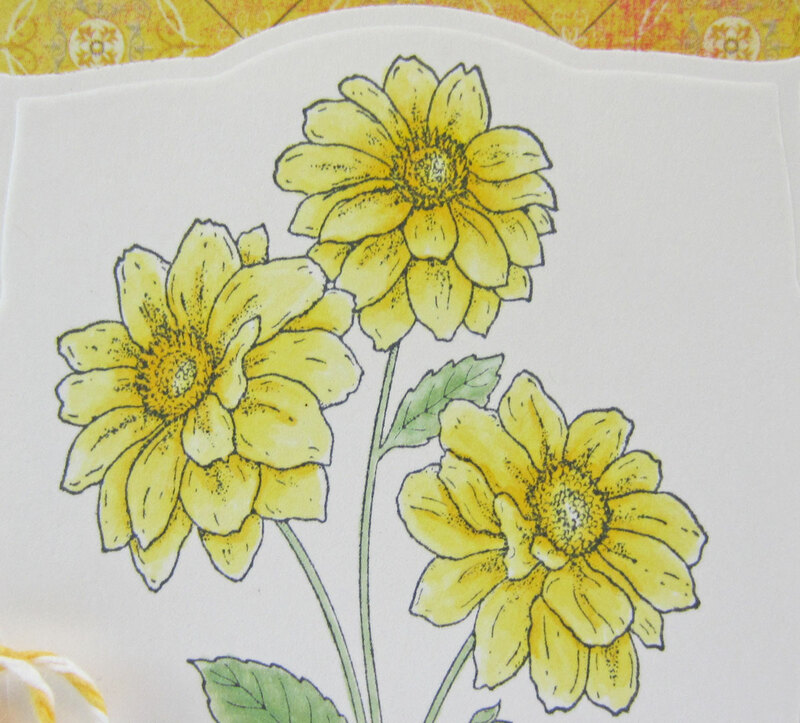 I created this bookmark by repeatedly stamping the sun rays in yellow and orange ink. 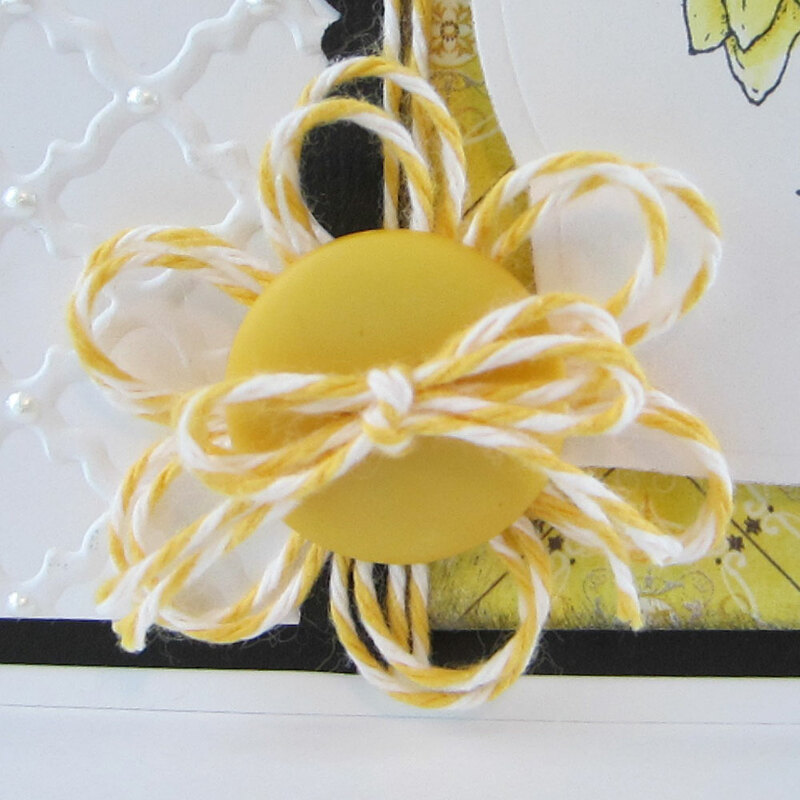 Once the ink was dry, I glued pieces of the Lemon Tart twine to the corner of the bookmark to form the sun. A simple sentiment is stamped in black and the final touch is the twine tassel. Have you joined in the Trendy Twine's monthly challenge? Check out the details HERE! We cannot wait to see your creations! Looking for more Trendy Twine inspiration? Join our Facebook group, Twine It Up, and take a look around! different color and starting a new challenge. What better color to celebrate Spring than a gorgeous yellow, Lemon Tart. It is such a bright and happy color, don't you think? And even better, it is on sale all month long for just $7.95, so you better grab it for your Trendy collection. 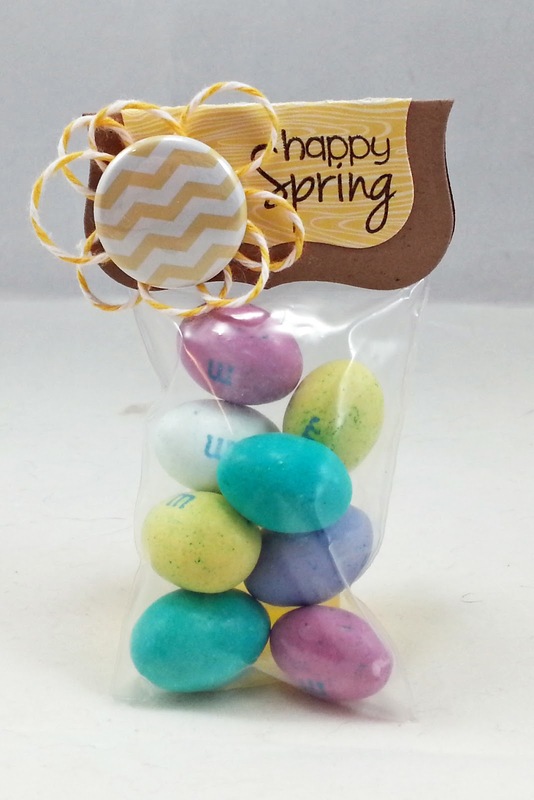 We also have a sweet little Spring mini pack that is available for the month of April. 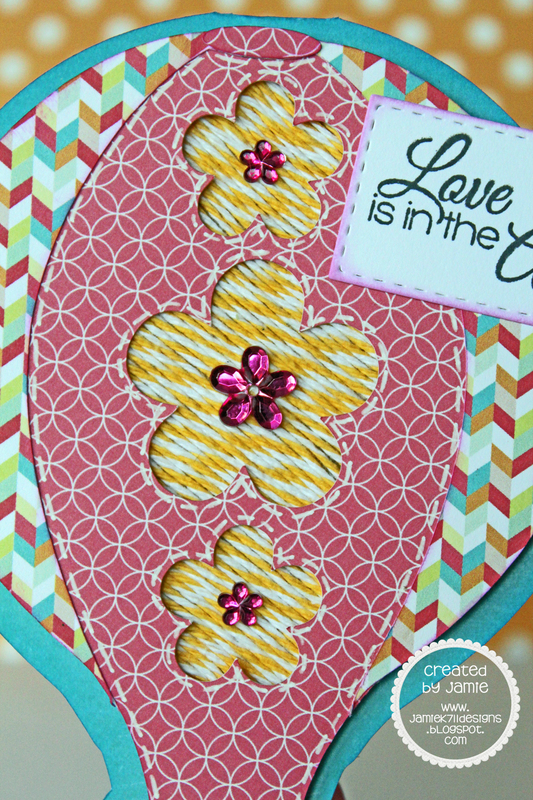 Ok, now let's move on to the good stuff... the fabulous projects the Trendy Gals created with this beautiful color. 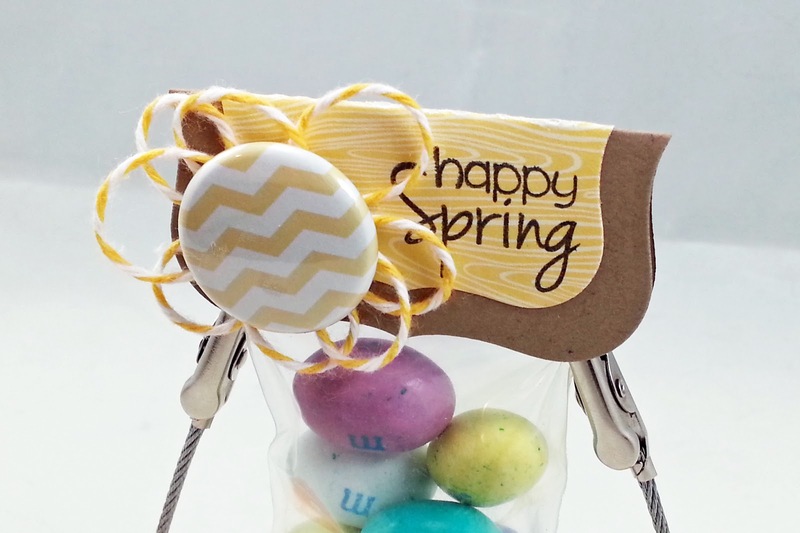 Now, all of that creativity ought to get you in a Springy, crafty mood. 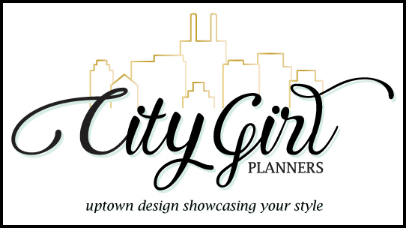 Check back throughout the month to see all of the projects by the Design Team. 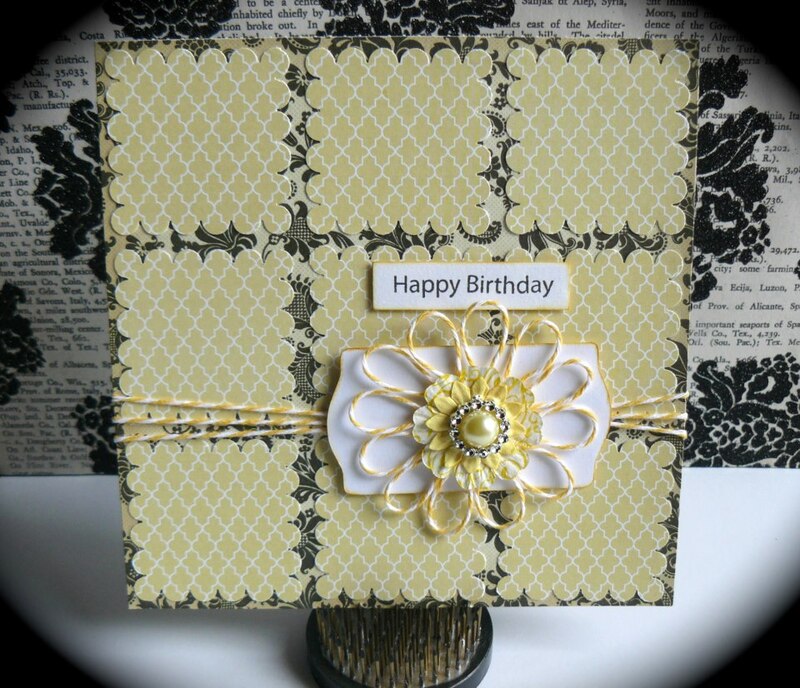 Plus, we are happy to have Kendra (Love 2 Scrap n' Make Cards) as our special guest designer this month. So we have a month full of twine awesomeness. 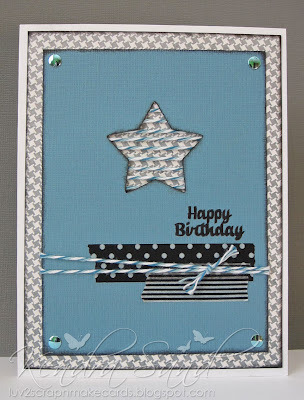 It's Kendra from Luv 2 Scrap N' Make Cards, I am so excited to be Guest Designing this month!! 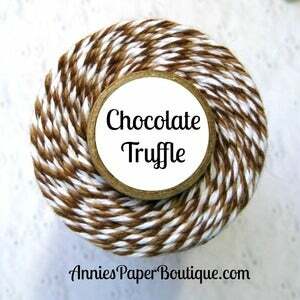 I just love my Trendy Twine!! I used Lemon Tart to create the fun button flower!! 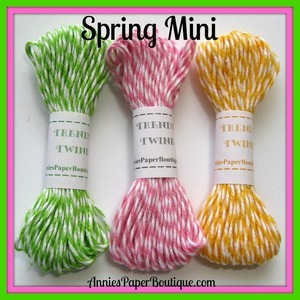 Join in this month's challenge, for a chance at winning a gift certificate to purchase some twine of your own!!! Just love the Lemon Tart twine? Great! It's on sale all month long for just $7.95. Make sure when you get your order to enter the April Challenge. You could win some nice goodies. 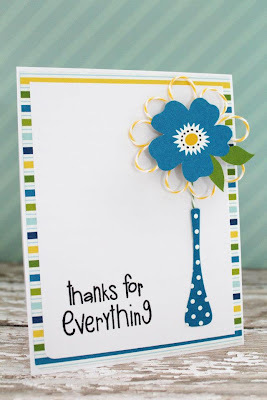 Thanks for stopping by the Trendy Twine blog today! 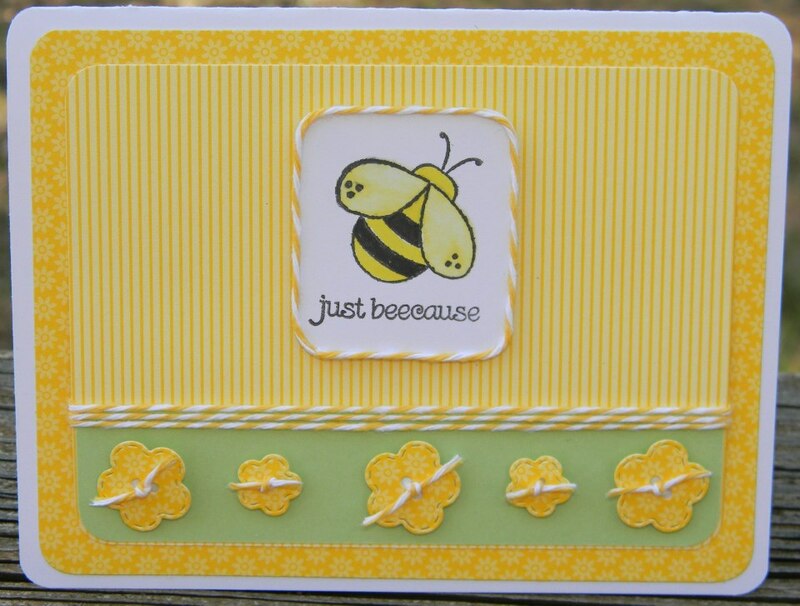 If you would like to see a few more pictures, head over to my blog, The Happy Card Encouragement Factory. Cya! 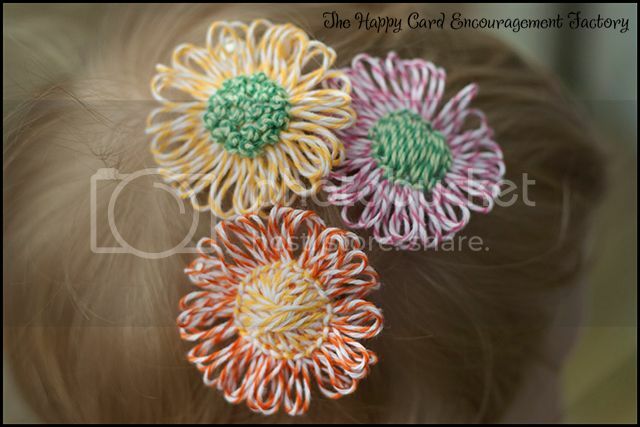 Such a perfect color for spring, for flowers and for babies! Which leads me to my project for today! 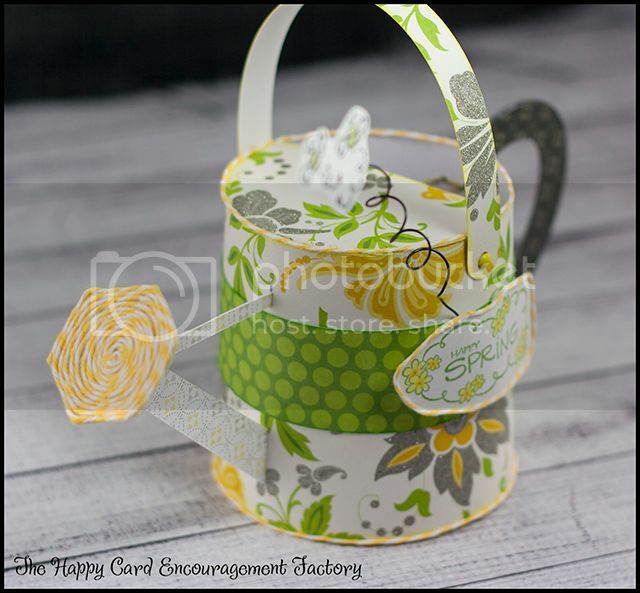 Spring is in the air and it is also getting to be baby season so for my project I made a cute baby gift box that can be used to hold a gift card, small treat or baby mementos. I have this obsession with making these trendy twine pom poms! Don't they look adorable as the antenna?? Here are the sides of each of the BABY box. I added some Lemon Tart Trendy twine to each of the letters. A loopy flower to the "B" and a double bow to the letters "A and Y"